Divorce and widowhood are still a financial shock for women, though many have been in the workforce for decades, according to the Allianz Women, Money, and Power study from insurance company Allianz Life. More than six in 10 divorced respondents (64 percent) said divorce created a financial crisis for them, and a nearly equal number (59 percent) said divorce was a real “wake-up call” financially. Although fewer widowed respondents (43 percent) said losing their spouses created a financial crisis, a full 60 percent felt the loss of their spouses served as a financial wake-up call. In 2016 there were over 13 million widows and this demographic is growing by 1 million per year. Women who reach age 65 have a 50 percent chance of living to age 88, according to a study by Allianz. 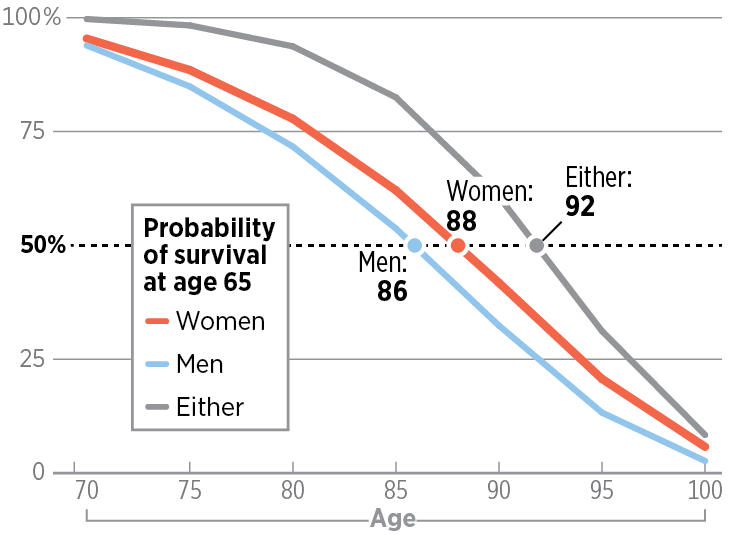 A male-female couple of age 65 have a 50 percent chance of at least one member living to age 92. 1. Take an inventory of your expenses. Take an inventory of your bills and create a plan to cover expenses for the first six to 12 months, limiting big decisions during this time. This allows for time to analyze the decisions that may eventually need to be made to develop new financial goals and objectives. 2. Think about your home, weighing your finances and your emotions. Review whether to stay in a current residence or move to a home requiring less maintenance and upkeep after one year has passed. This can be a difficult decision. Most widows choose to stay in the homes where their children grew up and some of their best memories will always be. Consider that just because a move may make economic sense, it may not be the best decision for you emotionally or for the long term. 3. Do some financial housekeeping. Update ownership of all investments and the beneficiary list on retirement accounts. If assets outside of retirement accounts are owned, consider titling those assets in a Living Trust or Transfer on Death designation so beneficiaries will receive assets without going through probate court upon your own death someday. This step is often overlooked, yet it can save heirs time and money. 4. See if your investments are a comfortable fit. Re-evaluate your investment portfolio to match needs and risk tolerance. Widows may have a different level of risk compared to their spouse’s investment philosophy. 5. Be especially careful at tax time. Work with a trained financial advisor or trusted family member during tax time the year after a spouse has passed. This is a good way to ensure that investments and insurance accounts have been changed to the surviving spouse. Tax documents help confirm whether the assets have been moved — and more important — if an account was missed during the inventory phase. Sometimes widows are surprised by the number of open accounts. These can include investments, bank accounts and credit cards. Whether a loved one has battled disease for a long time or was taken quickly doesn’t matter when a widow is grieving. The length and depth of grief can vary significantly from one person to another, and it’s important not to begin making important financial decisions until you are emotionally strong and clear-minded enough to make decisions that you will not regret later.